He was born in Biar Alicante in 1979. In 2003, he received his degree in Trombone with Honour at the Conservatory of Music “Joaquín Rodrigo” of Valencia and in 2006 he obtained his Trombone Basse Prix with Mention Très Bien from the CNSMD in Paris. He received classes and advice from several teachers, among them Indalecio Bonet, Carlos Gil, Stéphane Loyer, Claude Chevaillier and Olivier Devaure. 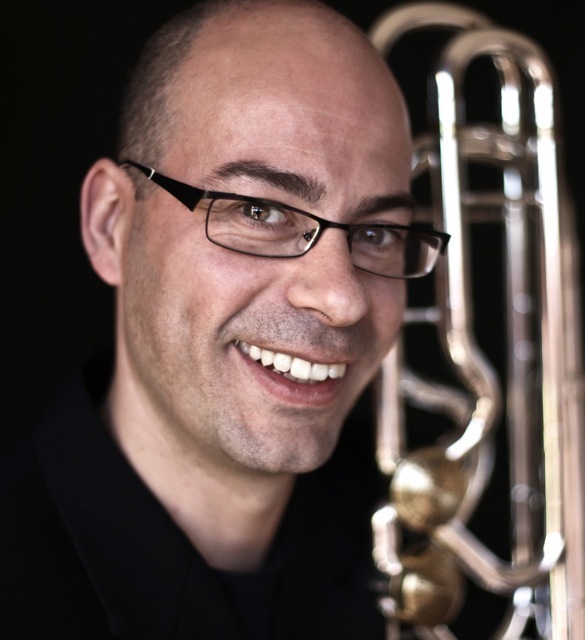 He is a founding member of the trombone quartet 2i2quartet, awarded at the Standing Young Performers Competition of Musical Youth of Spain (2001), with which he mantains a continuous concert and pedagogical activity. He collaborated with the most prestigious orchestras in Spain and France and with the Mozart Orchestra. He took part in several youth orchestras: Gustav Mahler Jugend Orchester- GMJO, Youth Orchestra of the Generalitat Valenciana, Band of the Federation of Music Societies of Valencia, National Youth Orchestra of Spain. He also made several solo concerts with various musical groups like the Youth Symphony Orchestra of the Generalitat Valenciana, Wind’s Orchestra “Filharmonia” Symphonic Band of Alicante and recitals at the Colegio Mayor Lluis Vives de Valencia, Spanish Brass Festival (SBALZ’06) and International Trombone Festival (París’12). His recordings include a collaboration in Spanish Brass Luur Metalls CD SBALZ and its important contribution to the second 2i2quartet CD “2i2versos”. Miguel plays instruments Stomvi model Titan. He has collaborated with Vicente Honorato, Stomvi president, in the investigation and development of the bass trombone.